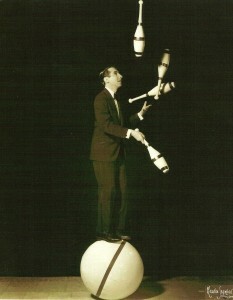 Ken Sherburne (1933-2009) was an American juggler who performed for over fifty years. 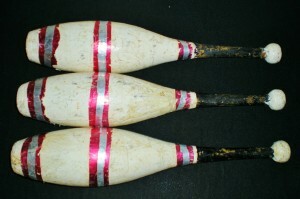 He was mentored by juggling legends Bill Moran, Bobby May, and Howard Nichols. He performed in a very wide array of venues and was well known for his work juggling on a giraffe unicycle or rolling globe. These are very large and very heavy Harry Lind clubs given to Ken Sherburne by his mentor, Bobby May, who had used them for many years before passing them along. The video below shows Ken juggling them on a rolling globe.